The Russian names for these missiles are the R-11, R-17 and R-300 Elbrus, and most of these are still in service today. The accuracy of these missiles range from 3000m (scud A) to 50m (Scud D) with an operational range from 180 km (Scud A) to 550 km (Scud C). 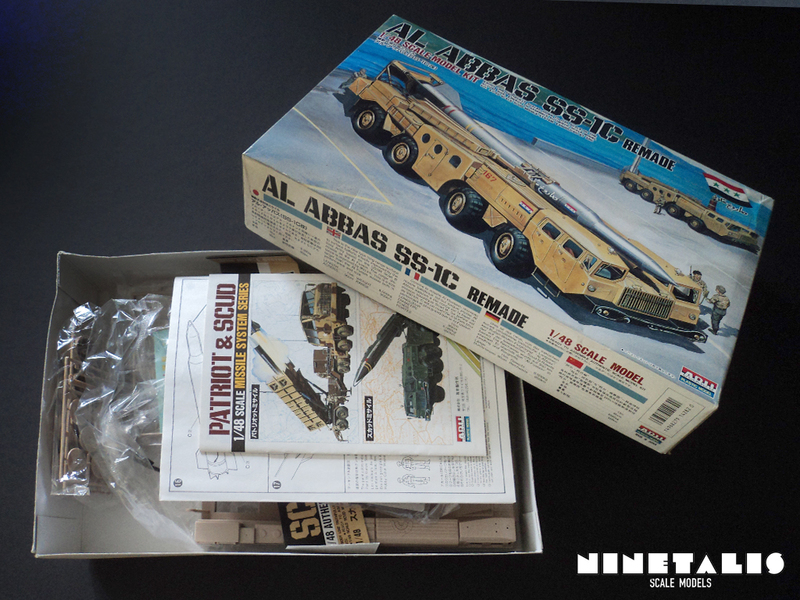 This kit contains the SS-1C of the missile series, which is another name for the Scud-B. 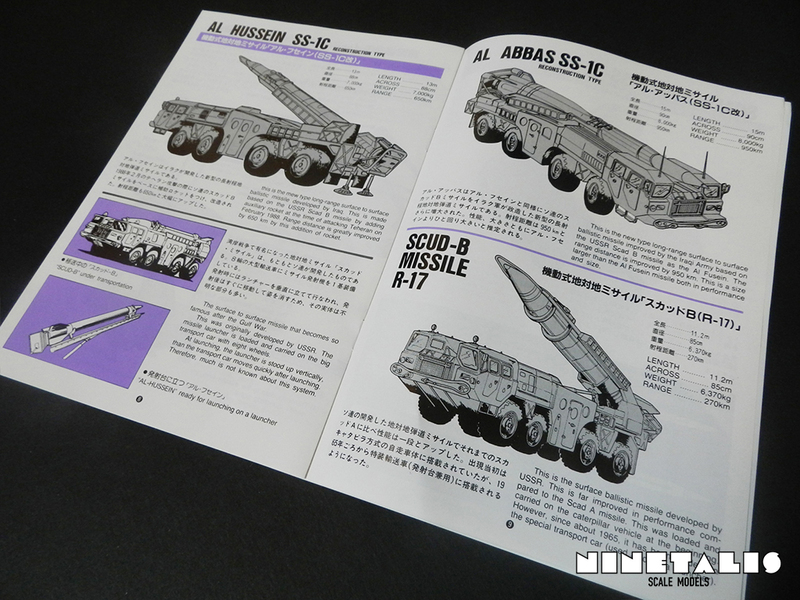 The missile is a bit different from the standard R-17/Scud-B version, as it features a differ tend warhead. 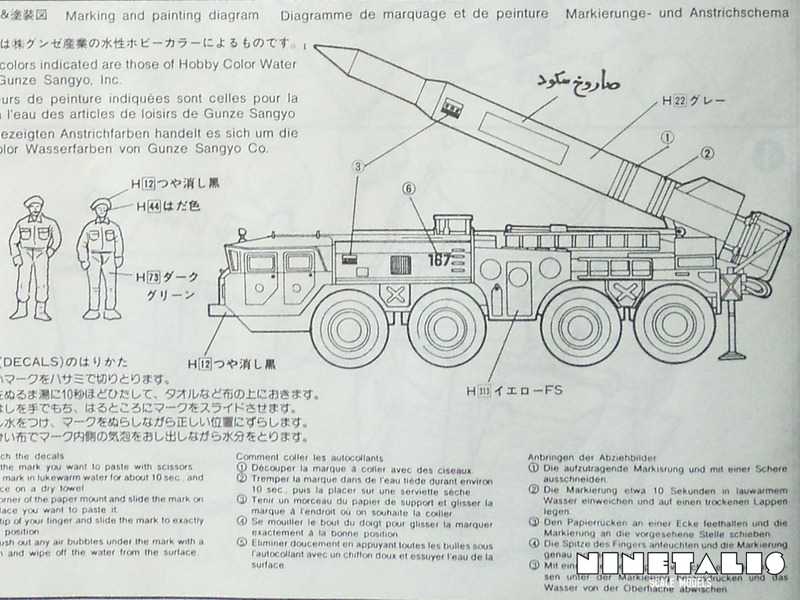 So as said in the previous part of our article, this kit consists of a SS-1C missile and a MAZ-7310 carrier. 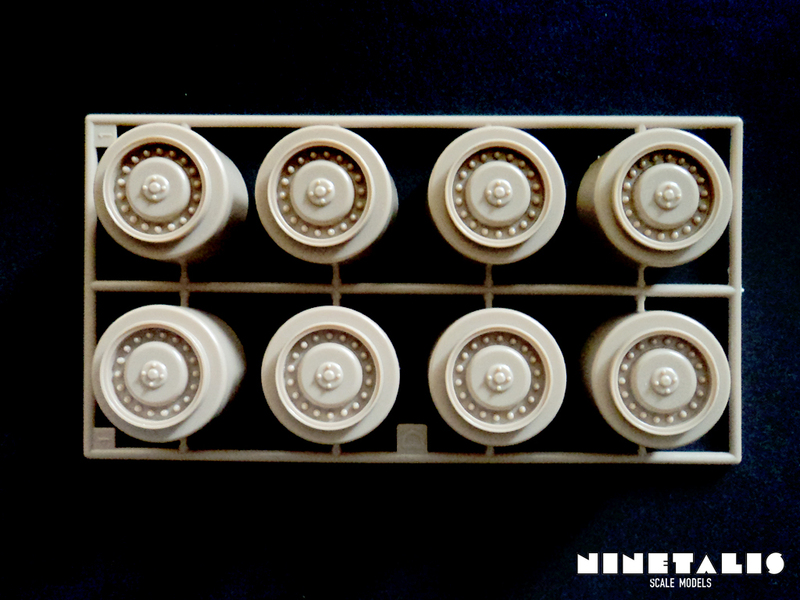 These are spread out over five sprues (4 for the Maz and one for the missile) and the upper and lower hull of the MAZ itself, eight vinyl wheels, a vinyl tube, four metal shafts, a small transparent plastic plate and a decal sheet. 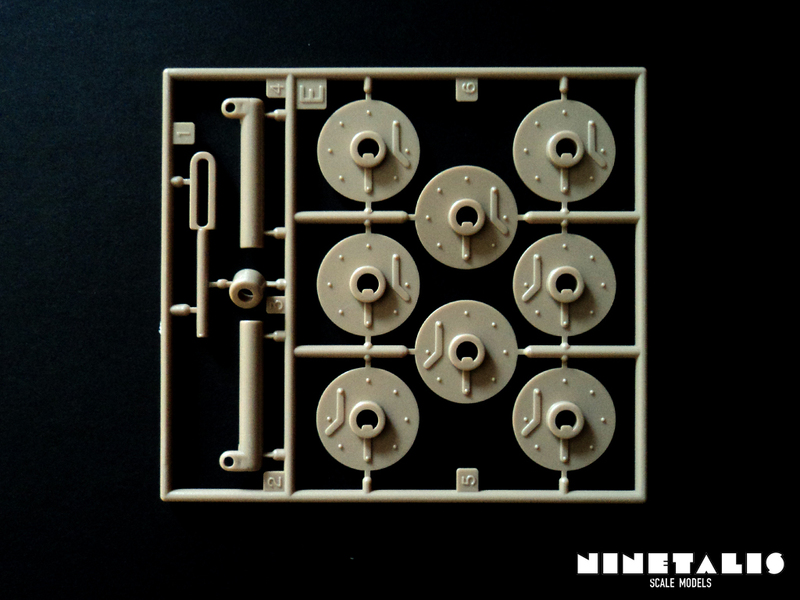 On the sprues we can find exactly 99 parts which look pretty decent, but not exactly too detailed. A few parts have small engraved lines but most are very basic. 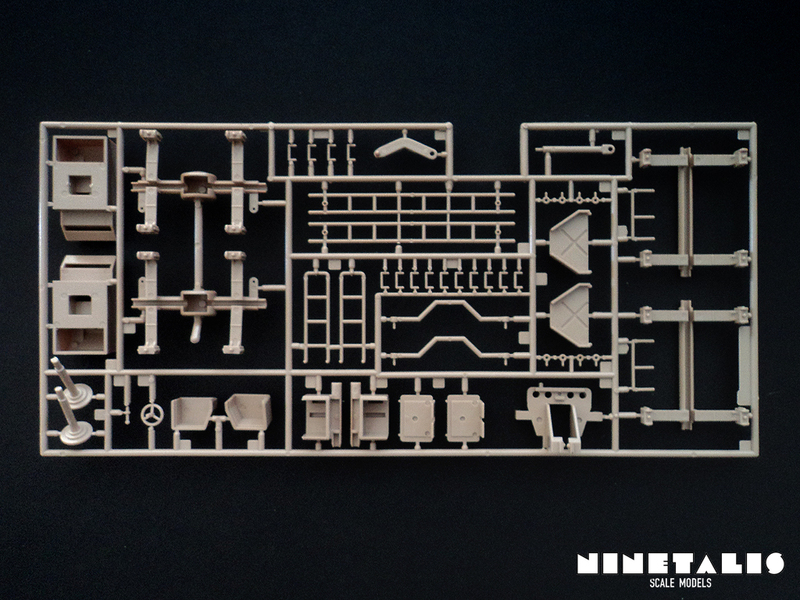 Nonetheless it seems that this will be a very neat model once build up and gives you the space to add some details yourself if you are up to that challenge. 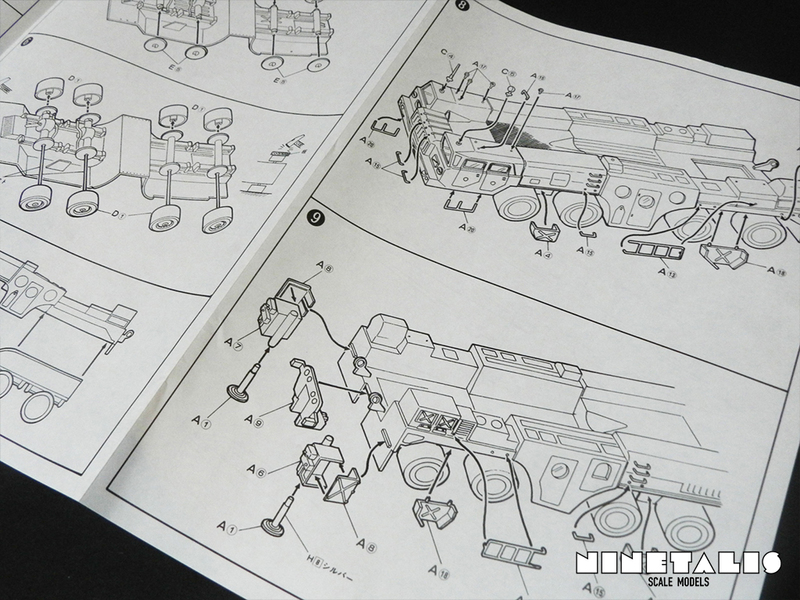 Judging from pictures found around the net, the MAZ seems to look fairly accurate depending on what version you want to build. 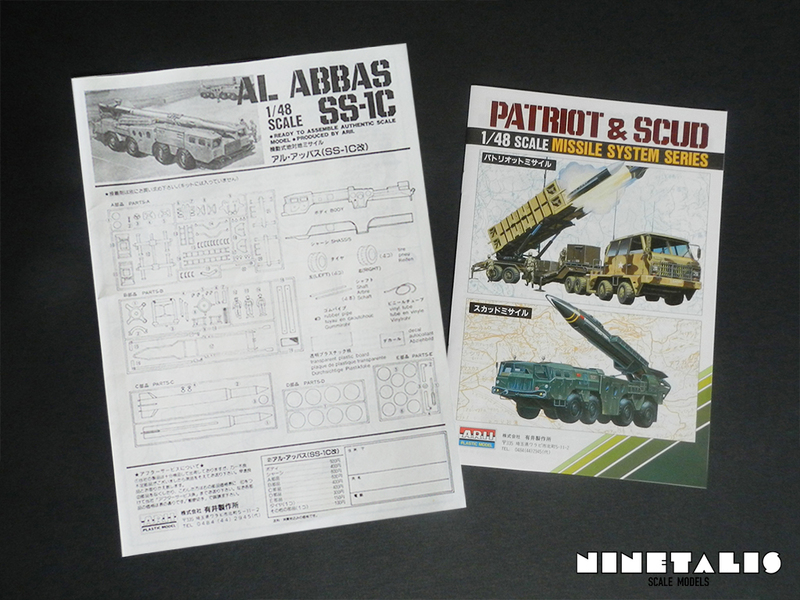 If you want a scud-B launcher version, then this looks quite like the real deal. Considering that this kit is still from around the 1980’s and when the Soviet Union was still very secretive towards the West, Arii did a really great job. 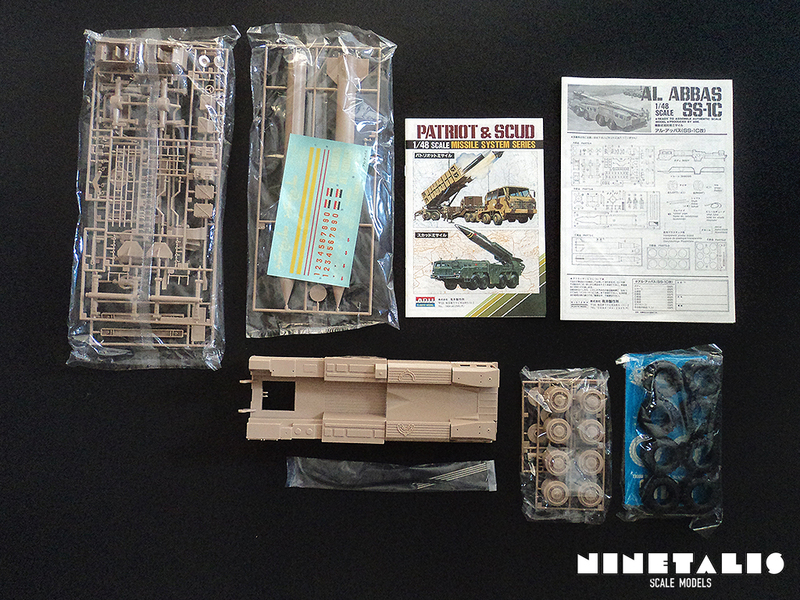 Now, when taking a first look at the contents, it looks like a nice kit at first sight. When examining the contents a bit closer, you can see a few flaws with the design process the manufacturer followed. An example, which is the biggest annoyance by far, is that there is some kind of a rope form molded on the front bumper, it doesn’t really lean on anything and eyes quite unrealistic. It could be fixed by adding some scratch build hooks with metal wire, or you can just remove the entirety of the rope from the bumper itself if you have the skill not to ruin the bumper in the meantime. Completely the opposite, a nice detail is that there is a roster molded on the top of the space where the missile leans on. It is very impressive to see such detail on such an old kit. However, there are sink marks right in the middle of this all and it will take an steady hand to remove this without damaging the roster to much. Consequently it also makes the rest of the pieces extremely basic looking, especially with the very wide panel lines, which are at least recessed. 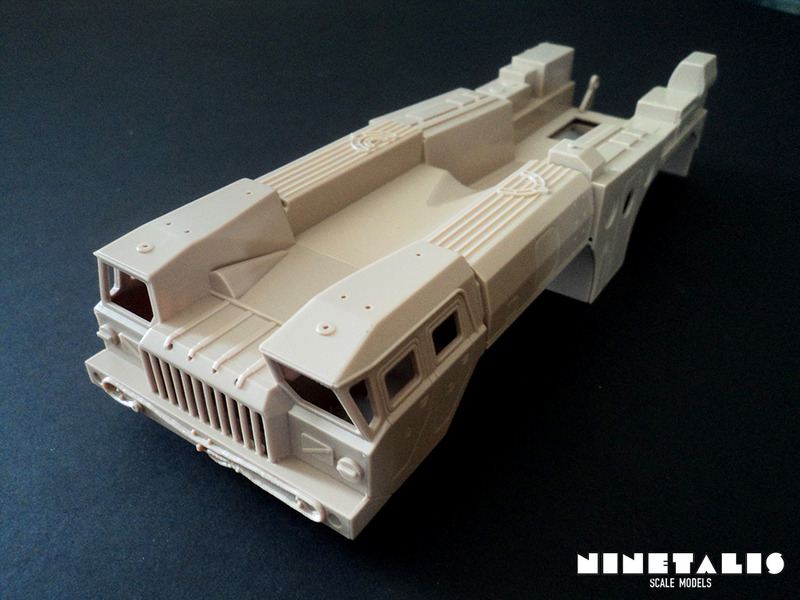 Also a part of the drivers cabin should be a bit bulged, which is not the case with this mold. 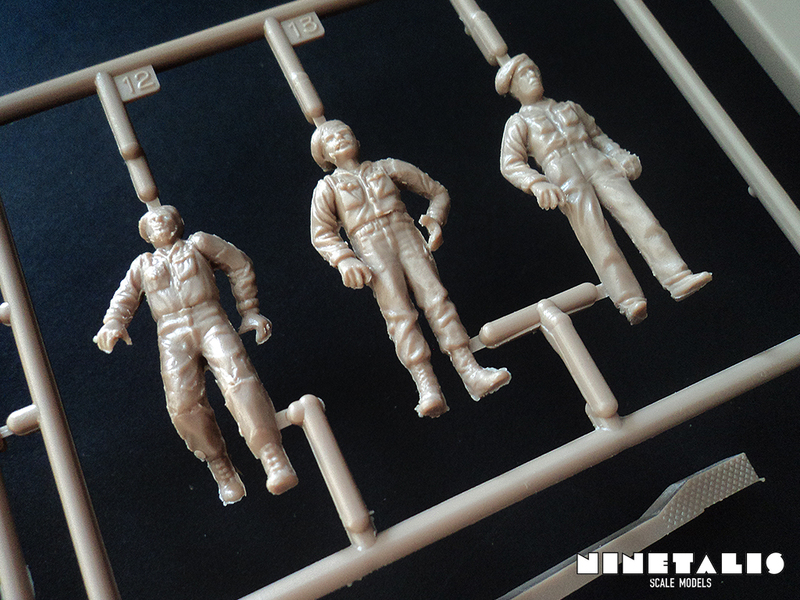 Included with the kit are also 3 figures. However, traces of flash can be found all around them, which should of course be cleaned up. 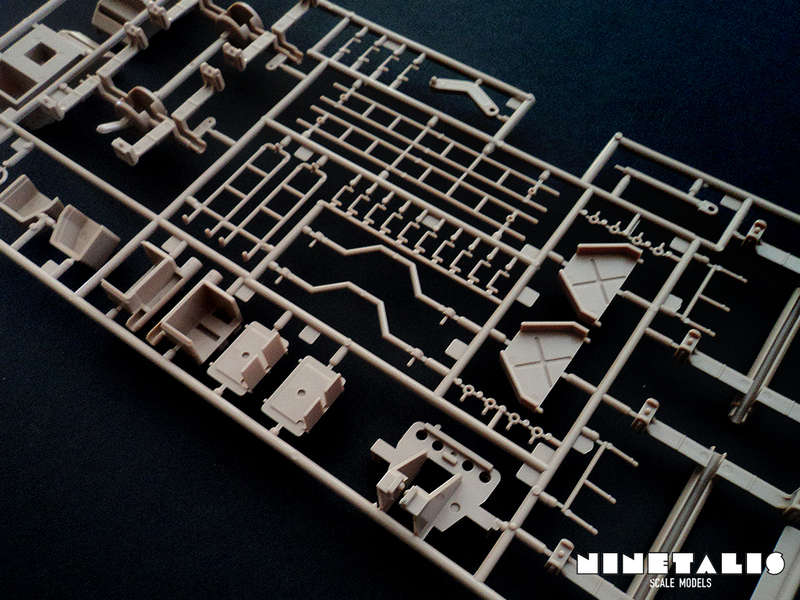 The other parts are quite basic looking, some have no panel lines at all. It makes one wonder if this is because of a lack of work into the kit or because these machines just nearly don’t have any detail. Personally, judging by the reference material I’ve found, It seems to be mostly because the machine is quite spartan looking in real life and has that ‘basic’ Soviet idea. It’s brutally simple, but it will get any job done it was designed for. Arii could however have pushed it a bit further, but you won’t notice it that much. 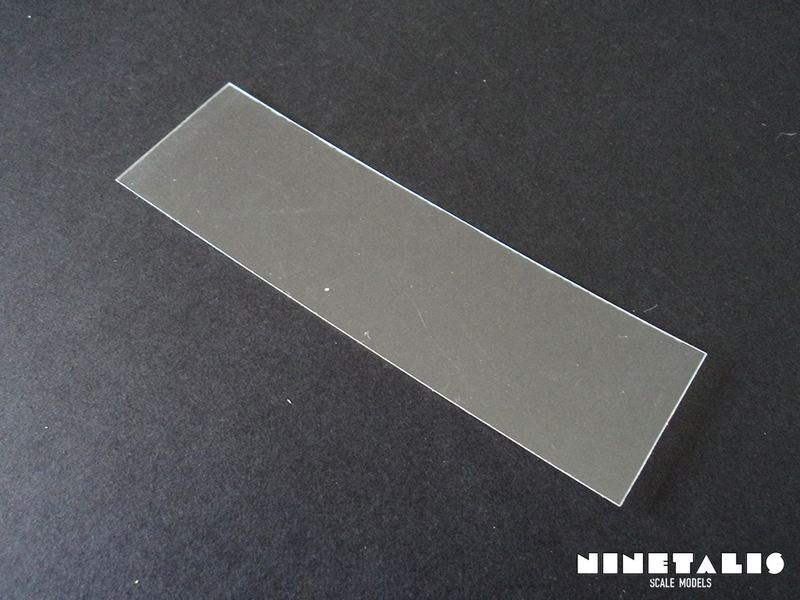 There are also a few molding lines on the parts which are quite apparent sometimes, but nothing which can’t be helped with a bit of cleaning with a small scalpel. 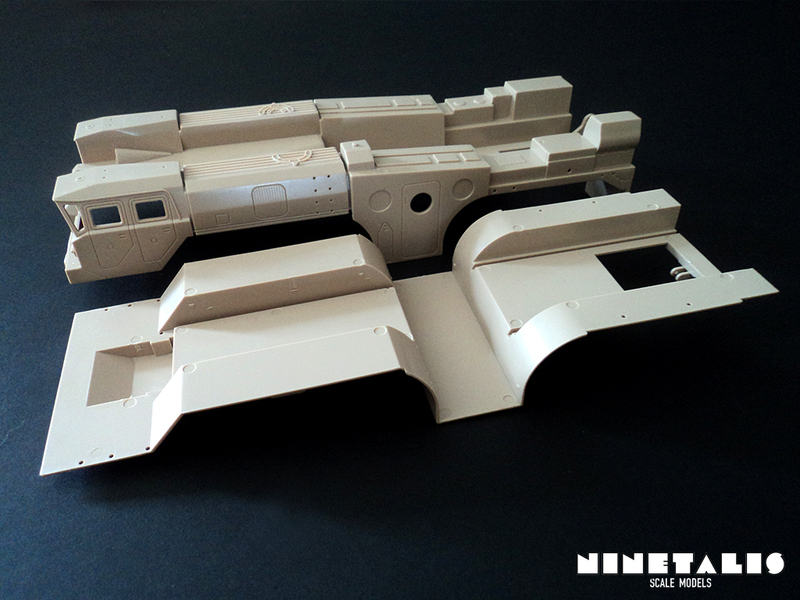 The biggest fallback is that there are no parts at all to create an interior of the drivers cabin. Not even a seat or a steering wheel. The decals are not really impressive. One look at it already tells you a lot. 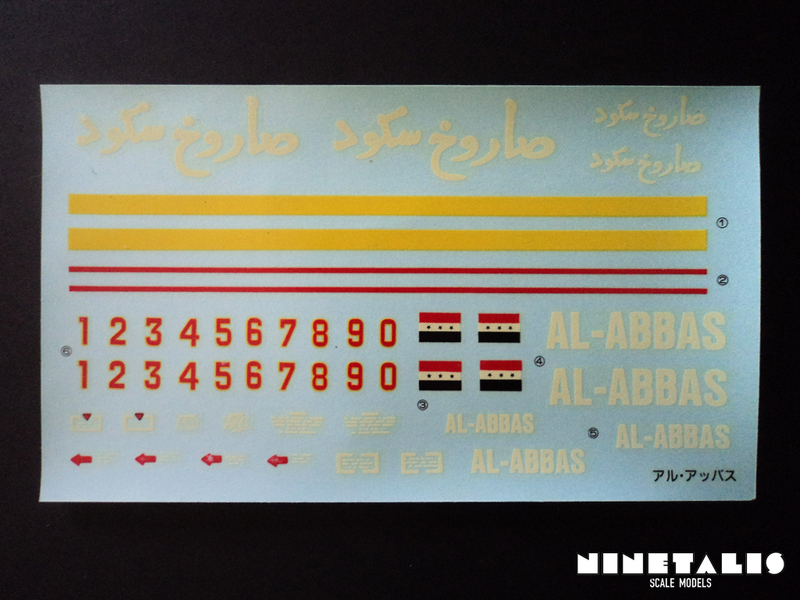 The clear border of the decals are really big and will definitely need to be cleaned up. The white has turned ‘yellowish’ and the underlying paint will probably be visible, although one can’t be sure of that until it has been tested. 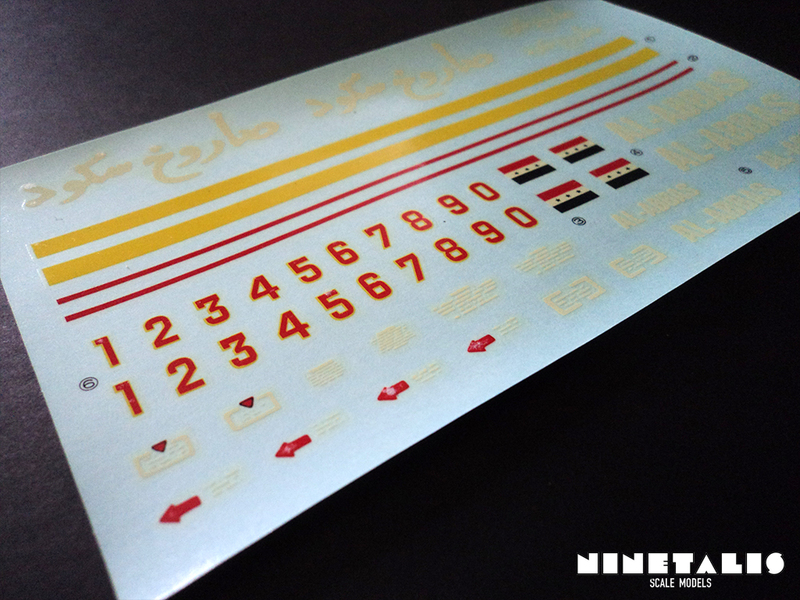 Another thing is the stencils. They are just white bars, not actual downsized text. This is definitely not because the text would be to small to print. Pretty much on the contrary, the text would be so big that it would stand out on the finished model that these are just bars and not actual text. 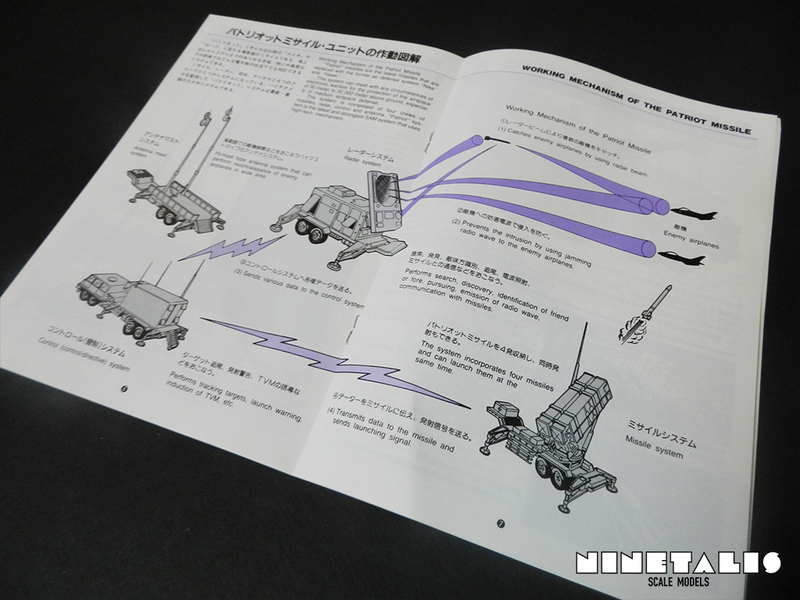 A question I also have is why there are red numbers on the sheet, as the only missile launchers I have seen so far sport white numbers or even more often have nothing at all. None ever wear these red numbers as far that I can tell. In my opinion this could really use a small update and so a raid on your spare box will definitely be required. 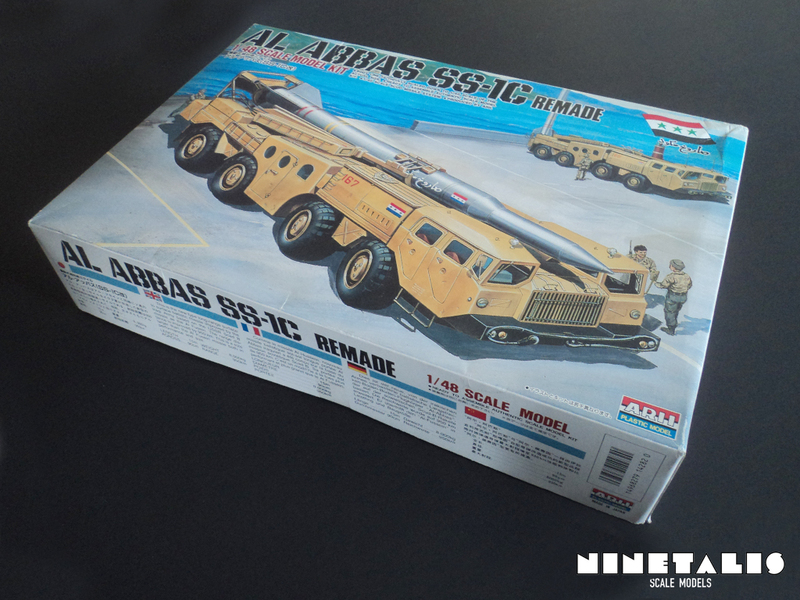 I won’t wrap anything around it, this is probably not your most accurate MAZ Scud-b launcher out there, but also keep in mind that this kit dates from the Cold War period and was probably the first option ever to build this machine. 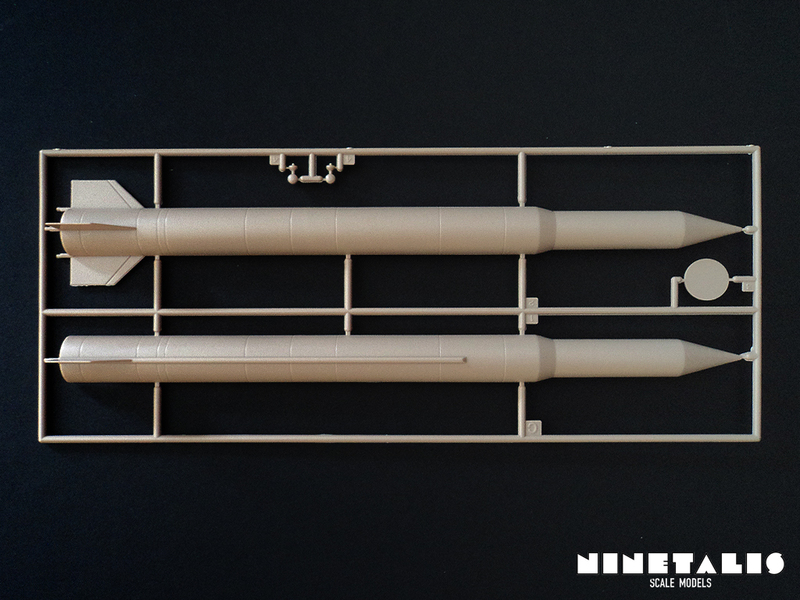 If you want the better ones out there, you have to look at the 1/35 scale line with the Dragon kit from the nineties, the newly released Trumpeter kit from 2014 or the coming 2015 kit from Meng Model, yet neither of these kits feature the SS-1C missile with this specific warhead. These will also cost you a whole lot more though. As I’ve paid only 15 euros for my Arii kit at retail, and the highest prices I’ve seen out there for these are about 32 euros, which is still only about half (or even less) of what these other kits go by. It has nice details like additional figurines (of good quality) and does sport some recessed panel lanes despite it’s age, which are often not found on kits from the era this kit descends from. 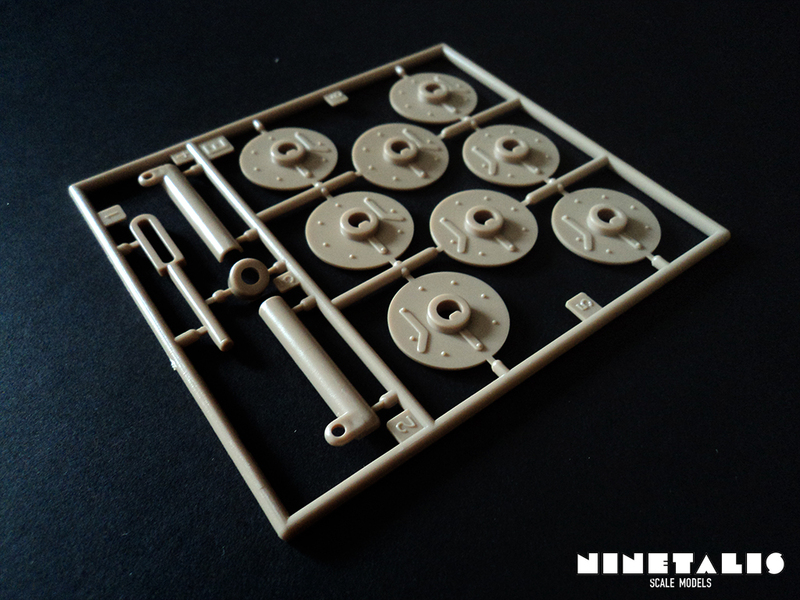 Finally, this is the only choice you have in 1/48 and makes an excellent kit for any ‘war gamer’ out there who likes to make their own 28mm pawns. 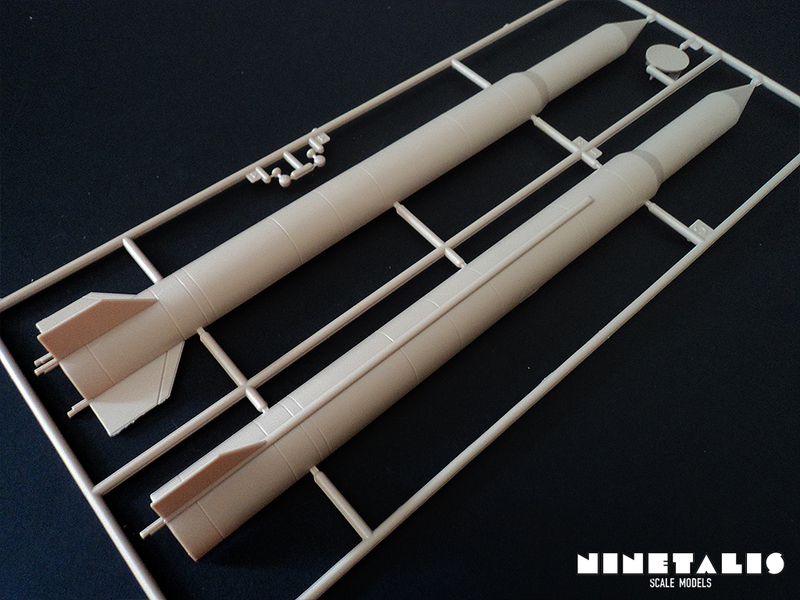 Also given somebody has some skill in scratch building, this could be used as base to make a quite accurate rendition of a SS-1C Launcher at a very reasonable price.